It is our pledge to the millions of pets and their human families, to forever produce the most powerful nutritional supplement that can help make pets healthy and keep them that way. NuVet® products are made in a FDA approved laboratory with natural, human grade ingredients specially compounded to deliver the most effective nutritional health benefits. Utilizing the latest advances in medical and nutritional science, we apply state of the art manufacturing technologies to help us maintain a standard of product quality and integrity that is virtually unheard of in the pet industry. • Amino acids – These immune system stimulants provide overall support to the body’s metabolism. Amino acids combine in a myriad of ways to form hundreds of different proteins that, among other things, support and enhance immune system function. NuVet Plus® contains all the amino acids essential to good health, including glutathione, an antioxidant that protects against toxins, L-lysine, which helps to neutralize viruses, and L-methionine, a good source of sulfur, which inactivates free radicals. L-methionine is very useful for allergy cases because it reduces the amount of histamine in the body. As levels of toxic substances and allergens in an animal’s system increase, the body requires more L-methionine to combat the effects of that increase, such as excessive tearing. • Beta carotene (Vitamin A) –This valuable antioxidant synergizes with Vitamin C to support skin and immune system and mucous membrane health to protect the body against invading microorganisms, allergens and inhaled toxins. Vitamin A is particularly important to eye health. Healthy eyes resist infection. • Blue green algae – Blue green algae, one of nature’s most basic foods, is an excellent source of chlorophyll, which acts as a detoxifier and blood cleanser, and sulfolypids, which resist viruses. This ingredient contains numerous trace minerals and more protein than any other whole food; it strengthens the immune system, aids in wound healing and boosts the production of red blood cells. By supporting an animal’s overall health, blue green algae boosts the body’s resistance against harmful microorganisms, toxins and allergens. • Brewer’s yeast – A rich source of B complex vitamins, brewer’s yeast contains the trace mineral chromium and a high quality protein that supports skin health and aids in tissue formation and the assimilation of fats, proteins and carbohydrates. Assimilation of this substance into an animal’s system also creates an environment hostile to fleas, thus preventing infestations that can affect the eyes and cause excessive tearing. When an infestation is present around the eyes, flea feces discolor the tears and cause tear staining on the affected animal’s face. • Chicken liver – Chicken liver is a rich source of the B complex vitamins that support overall health by fighting inflammation and boosting immunity, thus supporting proper nutrient absorption, minimizing damage from contact allergen reactions and strengthening the body against the development of tear-producing allergies in the first place. Like Vitamin C, it also reduces the deleterious effects of stress on the body. NuVet Plus® paddle-dries its chicken liver to more effectively retain Vitamin B complex, Vitamins A and C, and important omega fatty acids. • Pine bark – Pine bark contains proanthocyanidids which, as anti-oxidants, are 20 times more effective than Vitamin C and 50 times more effective than Vitamin E. Pine bark possesses the ability to minimize any potential damage from cell oxidation by seeking out and destroying free radicals, and like L-methionine, reduces the release of histamine. • Vitamin B complex (which contains folic acid) and Vitamin B2 (riboflavin) – These important vitamins support healthy vision. 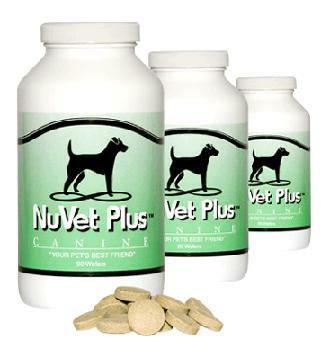 NuVet Labs® has been making the finest nutritional pet supplements since 1997. Our mission is to provide your pet wit h products that are completely safe, nutrient rich and formulated to combat disease at their source, while strengthening the immune system and giving your pet many healthy years of life. We are proud to stand behind our products with a 60 day, 100% satisfaction guarantee. If after trying the product you are not satisfied for any reason, follow the simple instructions below and we will give you your money back. Should you desire to receive a refund, please contact us via phone or email to receive a return authorization number. We require that the customer return any unused portion with the bottle (even if the bottle is empty) to our office within 60 days of purchase. Customers are responsible for all shipping costs. If a customer is on AutoShip and does not cancel their order before a shipment takes place, a 20% destruction fee will apply. Please note: Because your pet’s health is our main concern and our products are manufactured in a FDA pharmaceutical laboratory, we do not re-sell the products once they have left our office, even if the package has not been opened. Make sure you check out the Ailments page and Testimonials. 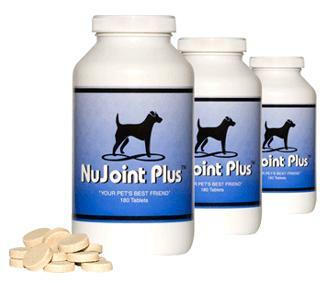 NuVet Plus and NewJoint Plus tops all the other products I have used or tried. I gave it the 60 day challenge and NuVet came out #1 for my Bulldogs. For my 8 and 10 year old Bullies you would never know they have arthritis. They can again get on the couch or bed by themselves and play with the young ones. 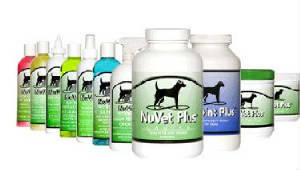 I will never use any other product and its highly recommended for every puppy that goes to their forever homes. Build up a better immune system from the beginning. I just can not say enough about NuVet Lab products.Try it for yourself and see the difference. Just click on the link above and place your order direct online, (Can not be bought in any retail store) so order now.